If you love traditional sushi or are a sushi purist, avert your eyes. This post is not for you. However if you ever wonder why you don’t see spicy tuna with cream cheese or how tempura prawn and unagi would taste together in a fusion roll, then this post is for you. 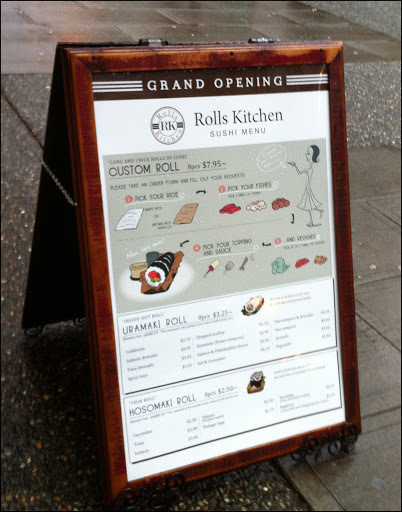 Recently across from the Central Vancouver Public Library on Robson Street, Rolls Kitchen opened. They had a soft open in late December and it didn’t seem that interesting as they were offering a very small menu of standard rolls. However, as I walked by in January, I noticed they had added a wrinkle in their menu: a customizable sushi roll. 3) 3 Vegetable items out of: Cucumber, Avocado, Tamago (apparently eggs are a veggie), Pickled Radish and/or Red Peppers. Well that’s what I could remember but I think there were options for some of the categories. Hand the form to the cashier and presto they make your custom creation. 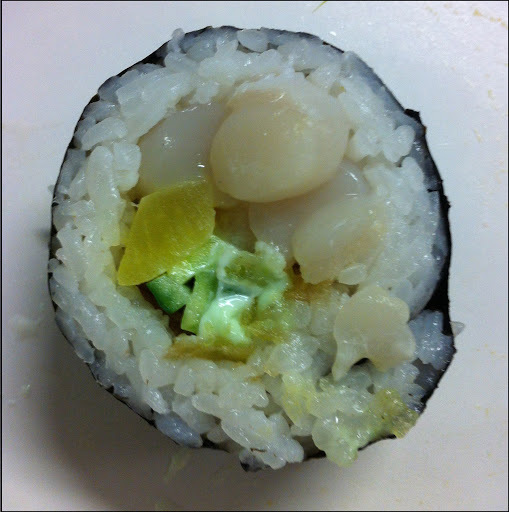 For my first attempt at DIY sushi, I went with White Rice, 2 X Scallops, Cucumber, Pickled Radish, Wasabi Mayo and Crunchy Tempura Bits. 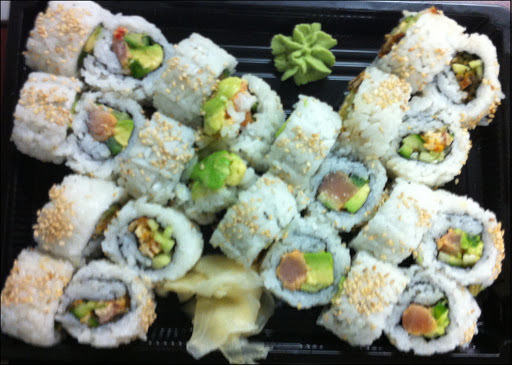 I also picked up 3 standard rolls of their menu (Spicy Tuna, Tempura Yam & Avocado and Unagi & Cucumber). All rolls were made only after I placed my order. All the ingredients in the filling were fresh and tasty. However the rice was gummier than I liked. As for my special scallop roll, I liked it. Although, it was strange to see a fusion roll made with the seaweed on the outside instead of the standard inside out roll. I liked my first experience enough that I went back for round 2. 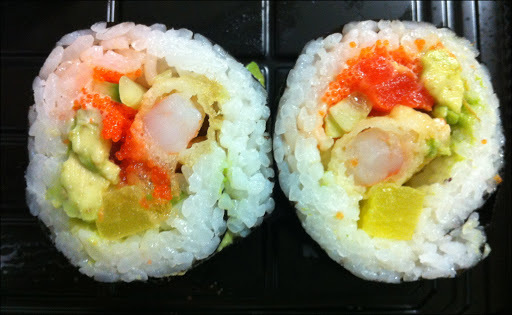 This time I went with White Rice, Salmon, Tempura Prawn, Cucumber, Avocado, Pickled Radish, Mayo and Masago. I also picked up a chopped scallop roll. I think I got a little too greedy by picking too many ingredients, as I didn’t like my 2ndcustom roll as much as my first roll. Too many competing flavours and textures. 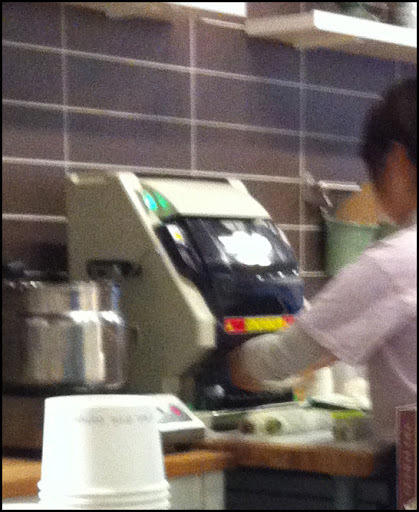 Another novel aspect of Rolls Kitchen is they use a machine to cut all the sushi rolls they make. They put it at the bottom of the machine and the roll shoots upward thru several blades. The server just retrieves the cut roll at the top of the device. Outside of doing this in your kitchen, mixing and matching ingredients in a sushi roll is just not possible in a restaurant. I think the concept of creating your own sushi is unique to Rolls Kitchen, as I haven’t seen other sushi places in Vancouver offer the option. It offers an opportunity for food enthusiasts, like me, to experiment and discover new flavour combinations, which I enjoy very much. As much as I like Rolls Kitchen’s novel idea of customizable sushi, the execution needs to improve. 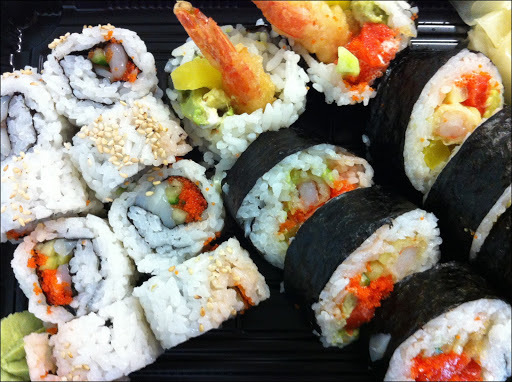 As you can see in some of the pictures, there’s too much rice in the standard rolls. In addition, some of the rolls were not formed tightly enough and as a result the rolls were flimsy and fell apart easily. 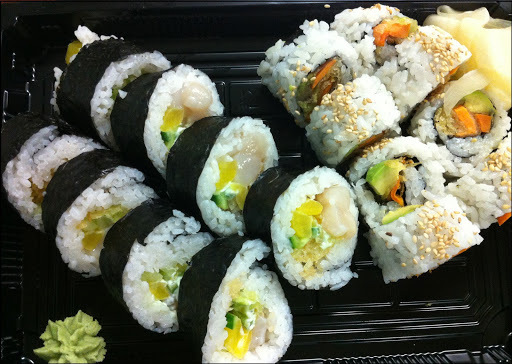 The preparation skills of the staff are below what other area sushi places are offering. I would also like to see the rice also be less gummy but the quality of the rice is not that far off from the other sushi joints within the area. Since Rolls Kitchen just opened, I’m willing to give the staff more time to work out the execution kinks. It might simply a matter of getting the staff more experienced in creating the sushi. However they do need to figure out soon since the novelty of the DIY sushi and the sushi cutting machine will loose its charm without a better prepared final product. FYI: I’m fairly sure Rolls Kitchen is affiliated with Ebi-Ten a few store fronts away. I saw staff delivering pre-packaged sushi to Ebi-Ten on my 2nd visit and on my 1stvisit a staff member went out of the eatery and tempura bits were mysteriously retrieved (I assumed from Ebi-Ten).